This article applies the tenets of Bernard’s in Counselor Edu Supervision 19:60–68, (1979) discrimination model of clinical supervision to the supervision needs of those who provide direct care to adolescents in residential treatment due to abuse, neglect, behavioral, or emotional problems. 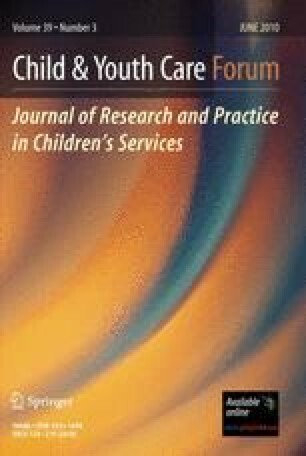 The article focuses on three areas (intentionality, flexibility, and professionalism) in which the model may be particularly effective in meeting the needs of youth care workers serving adolescents in residential treatment in the United States. Association for Child & Youth Care Practice. (1995). Ethics of child & youth care professionals. Retrieved from http://www.acycp.org/standards/CYC%20Ethics%20Code%20Rev%209.2009.pdf. Mattingly, M. A., Stuart, C., & VanderVen, K. (2002). North American certification project (NACP): Competencies for professional child and youth work practitioners. Retrieved from http://www.acycp.org/standards/CYCcomp10-20-2001.pdf.